The early opening on a non-holiday weekend is a trend that's mostly died out thanks to Thursday evening screenings, though it comes back from time to time. One thing's for certain, it's not the tactic of a studio that's confident in a film. Transformers: The Last Knight is the fifth of these interminable films, of which have produced *almost* an hour's worth of non-ironic entertainment. They've been ungodly profitable up until now, thanks to Michael Bay's explosion- and chrome-heavy direction, turning the transforming toy franchise into a multi-billion dollar film enterprise. Having gone through a couple of iterations in terms of plot style and story arc, it's now well into the “ah, screw it, throw it in” school of screenwriting, concocting a mythos that combines the Transformers with King Arthur's knights, Hitler, and the moon landing (no, really). I feel like some of this should have come out in previous movies. Mark Wahlberg returns as robot scientist (uh huh) Cade Yeager, although his family from the previous film is gone along with, one presumes, the awkward subplot about consent age. This time, the money truck backs up to Anthony Hopkins' house, of all people, who is called on to lend an air of gravitas and authority to the CGI mess (“Just drop the Oscar off here? Yes, very well then.”). In a series that's invented the idea of visual noise, this seems to be the noisiest- though the foley artists are gettin' paaaaid too. And yet, even hewing to the same formula, there's a sense that enough may be finally starting to be enough. 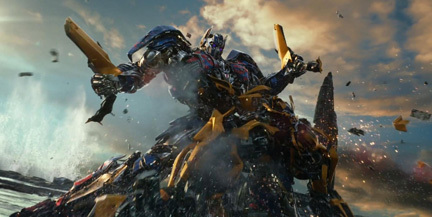 The last two years have seen a few franchises push things just a little too far, and despite the $100 million opening and freaking-billion-dollar worldwide gross of Age of Extinction just three years ago, The Last Knight is meeting with angry yawns. Ten years is a very long time for any franchise to sustain itself, and the $150 million gap in domestic gross between 2009's Revenge of the Fallen and the 2014 entry has to be troubling. More and more, these films are geared towards international audiences, and the product placements are even starting to work in that direction. Reviews, which once were somewhat accommodating to these films as spectacle, having fallen through the floor. There's at least two more of these planned plus a Bumblebee spinoff, but this might be doubtful if we can draw the line here. Debuting on Wednesday and with the weekend all to itself as a new film, it's headed towards a major drop relative to the franchise, with about $55 million on the weekend, and about $80 million over five days.